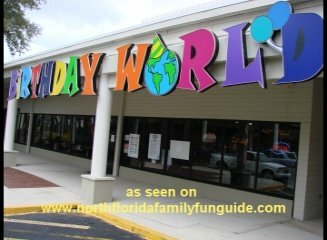 Birthday World is a 21,000 indoor amusement park for children! This amazing indoor carnival is the ultimate children's birthday party experience 365 days a year. Every day is like your birthday at Birthday World. Of course, they also host some amazing group birthday parties, and special events too. For only $10, you can buy a wristband good for unlimited rides on the flying banana ride, spinning tea cups, a carousel, bumper cars, and even an indoor train roller coaster. For only $3 more you can play black light miniature golf too! There are 2 bounce houses, too, one in a separate play area for kids 4 years old and younger called the Toddler Zone. This area also includes a toddler tumble inflatable, and some light up pretend cars, firetruck, and a trolley, and more. Test your skills in their large arcade filled with games of skill, and redeem your tickets for fun prizes. Pizza, ice cream, pretzels, snacks and more are available in the snack bar. If you have not packed the kids in the car and started your engines yet, there's even more! The first Friday of every month they host a DJ dance party from 6 to 9pm that includes, dancing, games, prizes and more!!! !This sounds like a blast! On specially selected Monday mornings, there is a visit from Mr. Richard, children's singer/songwriter for some music fun! On Mondays from 10am to 3pm unlimited wristbands are only $8 each! Bryan had an amazing experience here. I think his favorite thing was a tie between the train roller coaster, and the flying banana ride. I can't even count how many times he rode them. We hope to be back to enjoy this place again. Birthday World opened in February of 2008, and has enjoyed some great success so far. This is worth a trip from anywhere in North Florida to come see this place!